Hospital cafeterias used to be pretty grim places to eat. The menu items offered were either the bland, dietetic type of food that patient's received, or it was food provided by outside vendors who had little vested interest in taste, health or nutrition. Lately this trend has been reversed. With the growing awareness that the hospital cafeteria can be both profitable for the hospital while providing more diverse, healthier and tastier options for the staff, visitors and even outsiders who work in the area of the hospital, hospital cafeterias have begun to view themselves in a different light. As hospital cafeterias see themselves as examples of healthy eating as well as profitable food centers, they are changing their prior image. Aside from the hospital staff, the patients, and their visitors, many other people come through hospitals. Be it on an outpatient basis; or a visit to a doctor whose offices are in the hospital, thousands of people can go through a hospital on a daily basis. Therefore hospitals have a vested interest in making their cafeteria food as attractive and tasty as possible. New style hospital cafeterias can have many different food stations on site. These include cold and hot food stations, freshly baked foods and steamed foods. Action food stations have also found popularity including grill stations, exhibitions stations and pizza stations. Additionally, favorites such as the salad bar, fresh fruit bars with toppings and ice cream bars have gained popularity in hospital cafeterias. Diverse food stations not only appeal to a wider range of people, but offers those who cannot make up their minds a great way to get a little bit of everything. Additionally, more attractive indoor and outdoor eating areas for families, guests and employees can make the experience eating at a hospital a more pleasurable one. Whether you are talking about the staff, visiting families, or others, the hospital cafeteria can easily become a place that is frequented constantly by many repeat visitors. As a result, you may need to have more than just a diverse choice of foods, you may also find that you need rotating specials that are not on the regular menu. Rotating specials can give regulars a reason to stop in and get something different to eat each day of the week. This is why hospital cafeterias are employing highly qualified chefs, along with dieticians, to plan their menus. Making sure that the food is going to attract diners and turn a profit has become almost as important as healthy menu planning for patients. There are some hospitals that have even started printing out a room service menu for families visiting patients in the hospital. These meals are served on attractive dinnerware, at the convenience of the families who order these meals. This way they eat with their loved ones. and spend more quality time together. 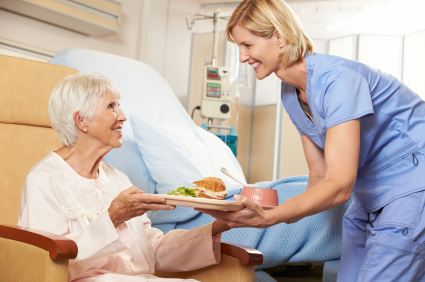 Orders are placed either directly at the nurses’ station or with specially appointed room service staff and the food is delivered right to the room. There are many options that hospital cafeterias can employ to expand their current offerings and promote their business. The welcome they receive by grateful staff and customers, along with the increase in profit, is usually well worth the investment.